U.S. President Donald Trump and North Korean dictator Kim Jong-un met this past week to reach an accord over North Korea’s nuclear program. Three president’s before Donald Trump have tried to get North Korea––through threats, through bribes, and through every possible medium––to abandon its nuclear programs, and obviously all have failed. Like them, Trump has also failed. 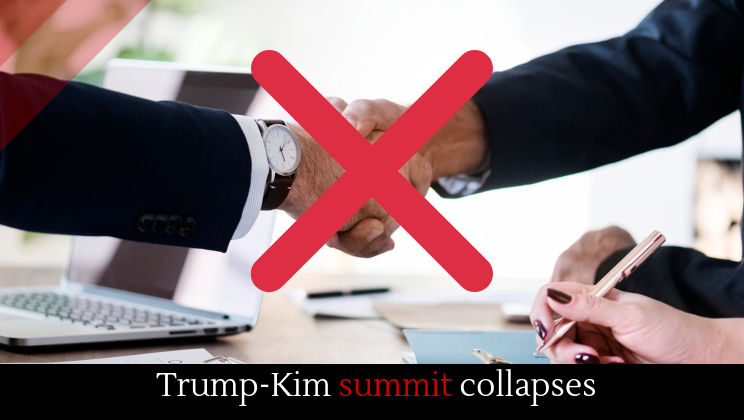 This past meeting collapsed when Kim Jong-un offered to dismantle its most significant nuclear facility under the condition that the United States lift all sanctions against North Korea. That, at least, is according to Donald Trump and the United States. The North Koreans say that they only asked for some of the sanctions to be lifted. The New York Times points out that this failure represents the risk of one-on-one diplomacy. When the negotiations began to break down between Trump and Jong-un, there was no one else to step in, no other way to escalate, and in short, no way to salvage the mission. The BBC chronicles the minute-by-minute drama of the Trump-Jong-un talks, if you want to see the breakdown.